These wooden lighthouses are handcrafted by Amish craftsmen using LP Smartside exterior grade wood. Each wood lighthouse is painted with exterior grade paint to ensure it will endure all types of weather conditions. 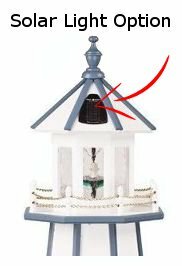 Add a nautical touch to your landscape with a garden lighthouse from Amish Country, Pennsylvania. Lighting Options: Our lighthouses come equipped with standard electrical accent lighting which plugs into a standard AC/DC outlet, several other lighting options are available. When choosing a lighthouse option consider placement of your lighthouse in relation to a power source and proximity to residences. Solar lights are a great solution if power source is not available and you desire illumination for your lighthouse. Take note with solar lighting options the roof of your lighthouse will have a solar panel attached to it, see photo below. Solar Light: Allows you to set your lighthouse virtually anywhere it has access to sunlight with no wiring needed. The solar collectors will gather sunlight during the day and the light will shine softly at night. This option comes equipped with a switch to change your light from steady to a “revolving/rotating light appearance”. When switch is turned to revolving, through the use of 8 LED bulbs fixed in a circle and 3 lighting at a time, as one light goes out the next one in the sequence lights creating a revolving/rotating light appearance. This lighting option is equivalent to a 4 watt bulb.